It's Monday, which means another dose of cold water is being poured over market euphoria, courtesy of the market's latest, and according to many most accurate, bear Morgan Stanley's chief equity strategist Michael Wilson. One day after Wilson blasted FOMO-mania, warning that "it’s misguided to assume that the profits recession has magically ended, and I see an increasing chance that it turns into an economic one if companies decide they want to protect profits by cutting labor, capex and inventory", the equity strategist has published a new note in which he warns that "with more than 100% of the rally in stocks this year coming from multiple expansion," the "moment of truth" is coming with 1Q earnings results. 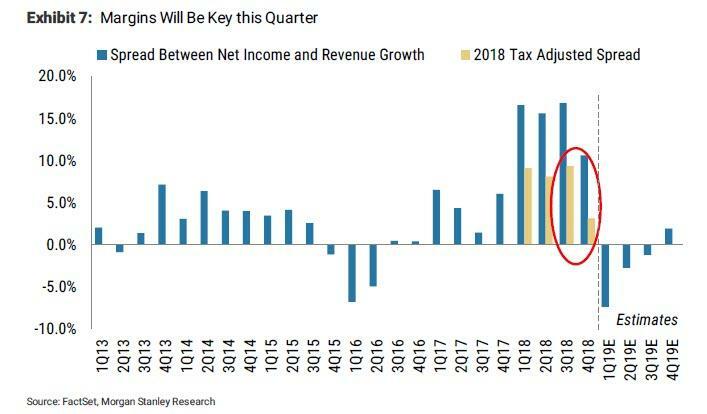 And since we already know that Q1 earnings will be the worst in three years, it will be "more about guidance since S&P 500 1Q estimates are now very achievable, having fallen close to 10% over the past 9 months" with corporate margins the big wildcard according to Morgan Stanley. ... as earnings are expected to shrink -4% y/y. However, unlike the rest of Wall Street which sees a prompt rebound in profits, Wilson believes "this quarter will mark the start of another earnings recession, which we define as two or more quarters of flat or negative growth." It's not all gloom and doom yet, and as MS caveats, US companies typically beat estimates by 4-6% as shown in the next chart. The 4Q18 results showed a lower than normal beat rate at just 3 percent and this was against earnings forecasts that had already come down significantly before they were reported. Even so, a lowered bar into the quarter does not mean the likelihood of a beat is greater: "The forecasts for 1Q19 have been lowered substantially and we do not think we are going to see a beat big enough to lift index growth into positive territory." Another potential wildcard: whereas earnings are sliding - largely due to a decline in profit margins - sales growth remains relatively solid, and is expected to be 4.8% for the S&P 500. Only two sectors, Energy and notably growth darling Tech, are expected to have negative sales growth. Health Care is expected to be the biggest contributor to index level sales growth boosting the overall number 2.1%. The sector is expected to grow 11.8% with the strongest growth coming from the Health Care Providers & Services industry group, which is predicted to grow 14.9%. Communication Services is expected to have the next highest sales growth at 11.8%. The rest of the sectors are expected to have tepid sales growth ranging from 2.6% - 4.9%. Keep in mind that all of the above is already largely priced in as even most market bulls and analysts are resigned to an earnings drop in Q1. 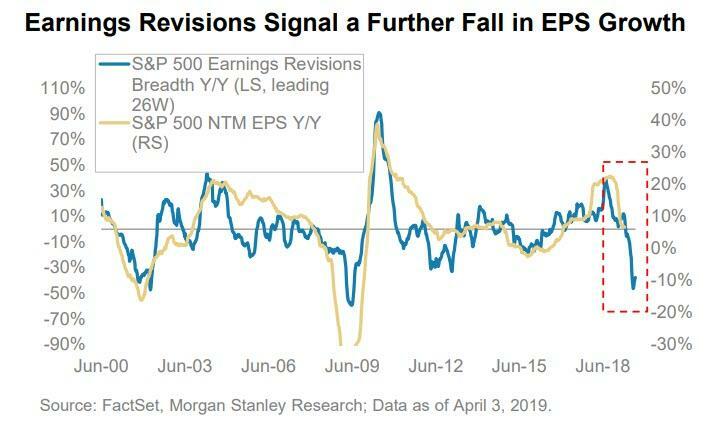 The question is what happens next, and whether Morgan Stanley's dismal thesis for a continued earnings (and potentially economic) recession, plays out. 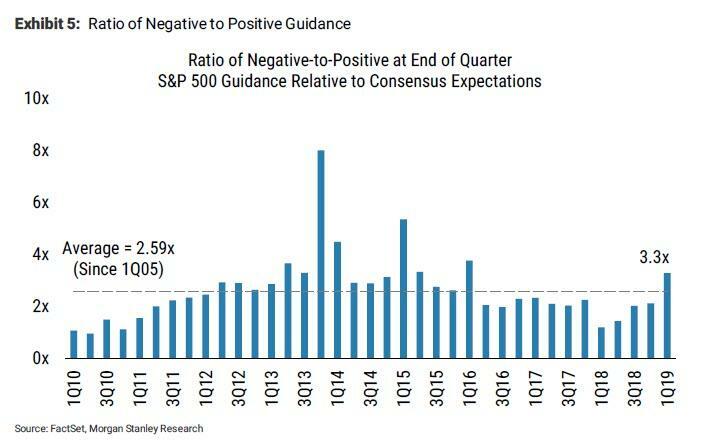 Which is why of key importance will be company guidance for the rest of the year, and here MS notes that "the ratio of companies offering negative guidance to those offering positive guidance is the highest it has been since the first quarter of 2016 at 3.3x." This is also above the average ratio since 2005 and supports Wilson's call for lackluster beats this season, or as he puts it "this is where the rubber will meet the road for stocks" and adds that "we're comfortable saying that the stock market is well aware of the weaker earnings growth expected this quarter. However, the real question at this point is what the second half of the year really looks like." And this is where Wall Street diverges: what happens in H2? Predictably, companies have kept an optimistic outlook with a large majority of those who have recently disappointed telling investors to expect a rebound from the first quarter or in the second half of the year. So what determine "the moment of truth for stocks" and what will happen in the second half? To answer that question, Morgan Stanley said that it "will be watching margin results very closely this quarter. Last year, earnings numbers received a one-time boost from tax reform. A good deal of earnings growth during 2018 could be attributed to these benefits. The yellow bars in Exhibit 7 show the spread between year-over-year net income growth and revenue growth adjusted for the tax bump. The tax adjusted spread fell dramatically between the third and fourth quarter, dropping from 9.4% to 3.1%. Margin expansion was difficult to come by late last year and consensus estimates are embedding margin contraction for the first three quarters of 2019." 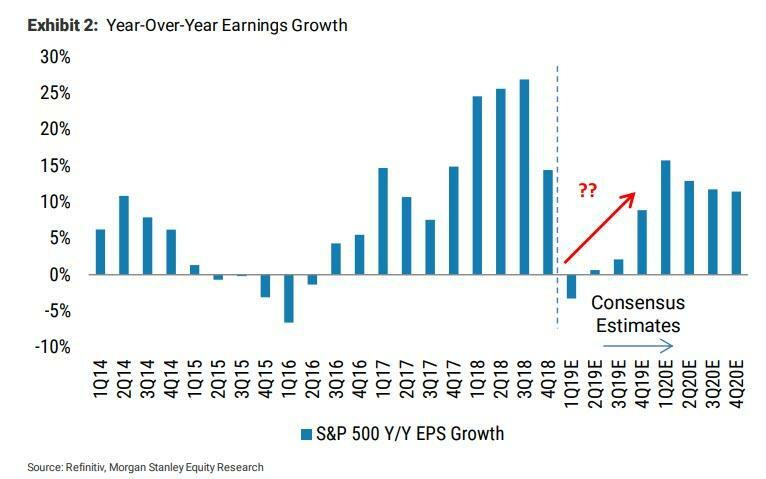 Another very troubling observation: if downward earnings revisions, traditionally a reliable leading indicator for forward earnings, is to be trusted, the coming earnings recession will not only be acute, it would be the worst plunge in EPS growth since the financial crisis. Which is not to say that Wall Street is completely oblivious to the risk of earnings dropping in the second half: to be sure, estimates for 2019 S&P EBIT margins have already fallen -0.8% since 3Q18. Energy, Communication Services, Materials, and Tech have seen bigger declines in margin estimates than the broader market, and zero sectors have seen margin estimates rise. And, as Wilson has repeatedly opined in recent months, labor costs will be one of the key pressures sending margins lower in 2019, especially since "Last quarter, the number of mentions of labor costs during earnings calls was the highest it has been since 2005 (Exhibit 9). We will be watching this earnings season." Finally, before Morgan Stanley is accused of being indiscriminately bearish no matter the context, Wilson is quick to caution clients that "Don't fight the Fed remains the right strategy. In 2018, it was about the Fed tightening in response to a fiscal policy that we believe was poorly timed and an overheating US economy. The result: a rolling bear market for global assets. In 2019, it's been about the Fed pivoting on that policy and asset prices rallying in unison and faster than they declined last year." Apparently, fighting the Fed in either direction is a bad idea. While we correctly forecasted the negative impact of a tightening Fed last year, we underestimated how positive the impact would be from the Fed's dovish pivot. As a result, we now find the S&P 500 inching closer to our Bull Case of 3000 well before we thought it would get there. And so with this caveat in the public doman, Wilson once again reminds readers that "with more than 100 percent of the rally this year coming from multiple expansion, we do wonder when, or if, investors will demand more evidence that growth is not only bottoming but accelerating. At 16.8x forward 12 month EPS, the S&P now trades at the very high end of our valuation range, offering little upside in the absence of a growth resurgence." At 16.8x we are confident that if we don't get the reacceleration now baked into the consensus expectations, it will be treated as a disappointment by investors, unlike in January when disappointing earnings results were greeted with positive stock price reactions. In summary, with first quarter earnings season about to begin, "the moment of truth has arrived—will companies continue to guide for a second-half recovery or lower the bar further?" Wilson suspects the powerful equity rally has left many management teams in a better mood that could encourage them to remain steadfast in the second-half recovery mantra, even if the evidence of one remains uncertain. Still, while Wilson has no way of knowing how companies will guide, the bank's leading earnings indictor continues to suggest strongly that CY19 estimates are still too high. "Therefore, we believe strong guidance should be viewed cautiously, and we would prefer to see the bar lowered further." 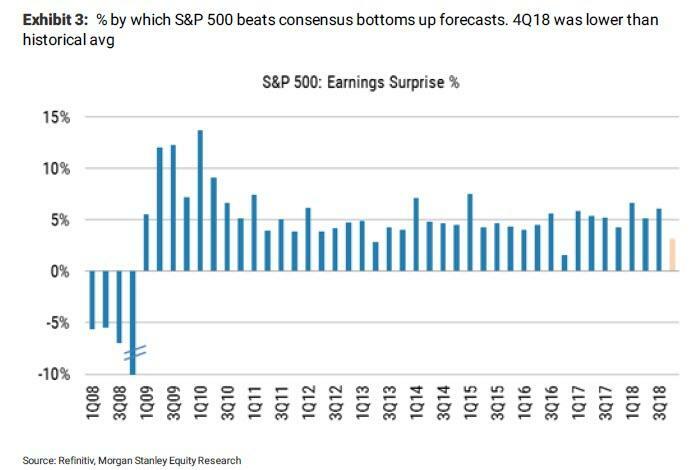 In short, where everyone else sees just a one quarter earnings blip, Morgan Stanley remains one of the few (bearish) outliers that sees the start of a protracted, and potentially painful earnings recession that if left unchecked, could mutate into the first full blown economic recession since 2009.